As much as science has helped us to understand our natural world, there are still plenty of anomalies it cannot explain. When confronted with some of nature’s most bizarre creations, even the most knowledgeable experts can sometimes be left scratching their heads. This is certainly the case with one rock cliff in China’s Guizhou Province called Chan Da Ya, which has been baffling geologists for decades. No one seems to be able to explain the unusual stone formations it “creates” every 30 years. The mountain is called Chan Da Ya, and the Mandarin name literally translates to “egg-laying cliff.” This 65-foot-long formation has been mysteriously sprouting stone “eggs” for generations, and no one has been able to explain why. According to Shui People from the local Gulu Zhai village nearby, the egg formations take 30 years to develop. 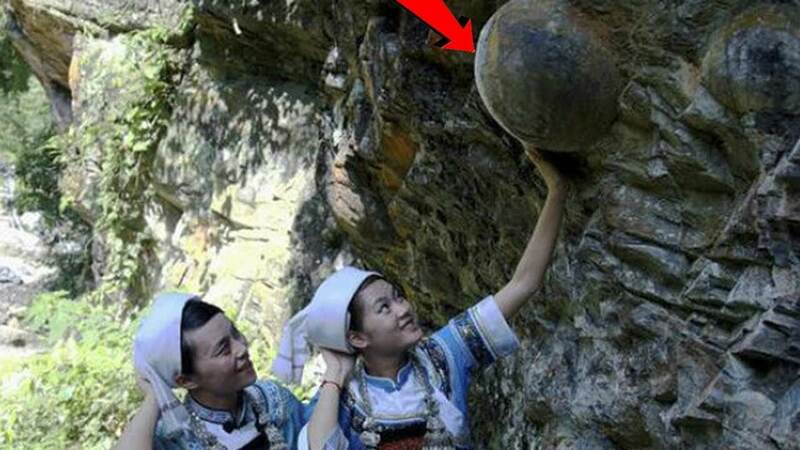 Villagers have known about this strange phenomenon for generations, and many of them journey to the cliff to touch the “god eggs,” believing that they bring good luck. In fact, nearly every one of the 125 Shui families who live in the Gulu Zhai village have at least one of the eggs displayed in their home for worship, and there are plenty more scattered throughout the village as a sign of good luck and prosperity. The mountain itself has even become a popular tourist attraction because of this inexplicable phenomenon. Unfortunately, this has also resulted in many of the fallen eggs being stolen and sold for a profit by treasure hunters. So, does anyone have a guess as to what’s happening here? The shapes are dark blue in color, and they resemble dinosaur eggs. They all vary in size; some of them are small enough to carry in one arm, and others can grow to a much larger size, even weighing as much as 660 pounds! Although the Chan Da Ya mountain has the highest concentration of these rock eggs, the Chinese media reports there are actually other sections of the mountain where they grow as well. Most of them stick out sideways just like on the Chan Da Ya, and others dangle from above like hornet nests. Geologists have yet to confirm what causes these “eggs.” Tests have shown these particular egg-growing regions of the mountain are made up of calcareous rock, which is easily eroded. However, the eggs are made up of a much tougher type of rock, which is why they remain after the surrounding stone wears away. The stones are said to have been formed millions of years ago during the Cambrian period. Experts are at a loss to explain how something that was formed 500 million years ago is only just appearing today, or why the stones are perfectly round in shape. Chickens are supposed to lay eggs, not mountains! Nature can be so mind-blowing sometimes. Share this bizarre phenomenon with your friends below!